Real World Example: What Would Lloyd Say? Recently I had the (on-going) opportunity to work with Lloyd Garver. Lloyd has been writing for decades for traditional media shows like Home Improvement and has also been writing a column for the CBSNews.com web site. Lloyd had been recording audio versions of his columns and placing them on his web site, but after talking with a mutual friend, he wanted to step up to full podcasting of his pieces. Each time I start a project like this, I am reminded of everything I had to learn over the course of my own podcasting career. In Lloyd’s case, he was already about 90% of the way towards podcasting. He had a web site, a blog and audio content already in the blog. Our focus was on setting up RSS feeds, registering the show in iTunes and statistics. First, I turned to my old favorite, Feedburner, to set up his podcast-ready feed. I started using Feedburner the minute it was announced as previously I was handwriting my RSS feed each time I released a show. Feedburner allows you to easily add all the specific tags for iTunes as well as tweak your feed and provide additional features. Once the feed was set up, we registered his show with the iTunes Podcast Directory. This should be the first stop in your podcast marketing, too. iTunes makes it easy to find and subscribe to podcasts, so this is always my first recommendation to anyone who wants to listen to podcasts or produce them. What Would Lloyd Say? was available in the iTunes Podcast Directory in about 48 hours. I find this fairly typical, although some people still report long lag times or never getting their show listed. Typically, this has to do with some issue in their RSS feed or the graphic used for the show artwork. Apple seems to want a 300x300x72dpi image for the artwork and tends to hiccup if it doesn’t meet those dimensions. Once a podcast is running, of course, you want to get some statistics to see how many listeners you have. 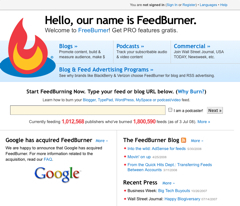 Feedburner provides a “subscribers” number each day and a combination of Google Analytics and web hosting company stats give us page views, but getting a simple count of the number of downloads can be tricky. The only true way to know how many downloads you have is to use the raw log files from your web hosting company or stats provided from a podcasting service like Libsyn.com. In many cases these days though, raw log files are either not available or costs extra each month. Hosting with GoDaddy.com as I am, Lloyd had to subscribe to the extra TrafficFacts service in order to get his raw log files. I am not happy about this, but it is one of the limitations of GoDaddy.com hosting. 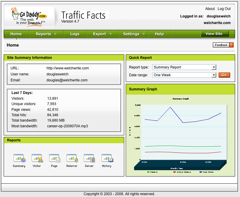 Once TrafficFacts was enabled, we were able to download the daily log files. Of course, you still need to process those logs in some way to pull out and count the MP3 downloads. On my Mac, I have a small shell script which does this for me, but Lloyd is using Windows. As he is new to this type of reporting, I fell back on a command-line based tool called podstats. This program was created by Kevin Devin, the founder of Friends in Tech of which I am a member. At the time, we needed a robust tool to report our downloads so that we could participate in a podcast advertising network. Unfortunately, the command line nature of the tool is not really the drag-and-drop simplicity we expect from Windows or Mac. That said, I was able to create a small batch file that allows Lloyd to drop a log file onto the program and get a nicely formatted report. This information can then be entered into an Excel spreadsheet to tracking, manipulation (averages, max, min, etc) and charting. So, that is my “real world example” of setting up a podcast. If you have questions about podcasting, whether recording, web sites, blogs or RSS feeds, leave a comment below and I (and other NMI members) are sure to chime in.